4. Click "Create new SVN"
This guide is for command-line based SVN. There are GUI tools like TortoiseSVN which can make your life easier! 2. Find your project under "Current SVN Projects"
* If this is a new repo not associated with a released addon, you will be prompted to select an existing addon or create a new one. 9. Click "Push Zip Live"
This will package everything in your /trunk and push it out as a release. If you want to put your files directly in /trunk (/trunk/AddonName.toc instead of /trunk/AddonName/AddonName.toc), you can set the "wowi:dirname" svn property on the trunk directory. This will force the packager to put all the files in /trunk into a folder with the name you specified. 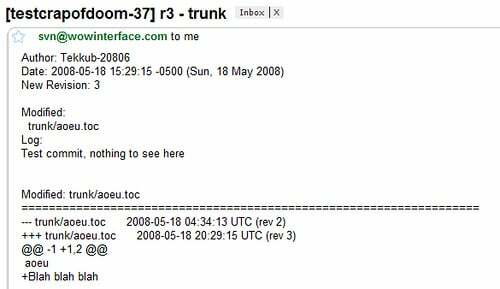 CIA.vc will echo your commit details into any IRC channel you want. Many developers have set up CIA bots on FreeNode, in channels like #WoWUIDev-commits. An email with details about the commit and diff output will be sent whenever a commit is made. You should probably use a mailing list like Google Groups to send your commit emails to. This allows any user who wishes to watch your project to subscribe easily. 4. Check "Disable public SVN viewing." Activating this option will make your repo private, only project members will be able to view and checkout. The string "wowi:revision" in ANY .toc file in the repository's trunk will be replaced with the current revision number of the entire repo when the files are zipped. This is similar to the svn:keyword "$", except that the repo's current revision is used. The svn:keyword uses the last revision the file was modified (so to keep it up to date you would have to "touch" the file with every commit). Also note that, unlike the svn:keyword, the string will NOT be replaced for users that checkout your addon directly from your SVN. If for example you test the addon's current version during runtime, you should account for users with svn checkout copies.